To make this ghorfa, Younes Rahmoun carefully respected local modes of production. 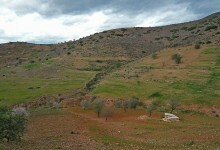 After visiting numerous plots of land, he chose an almond field measuring about 990 meters that borders a river, not too close to nor too far from the village. Then came the time to build. The stones used for the walls come from the neighboring river; unlike brick, which unfortunately is often used in Morocco despite its lack of insulating properties, the stones are particularly well adapted to the region’s warm climate. The walls are entirely covered with a mix of dirt and straw called pisé and the roof is made with tree branches and has a relatively thick diameter. They are sealed with a layer of clay and concrete. The entire building is reinforced with concrete, which requires little upkeep. Finally, the finely crafted wooden door has a lock, which allows whoever wishes to stay there for a while to protect her belongings. By choosing to combine modern and traditional materials in this way, the artist seeks to show that it is possible to construct something solid and durable while also perpetuating the use of stone and pisé which are perfectly adapted to the region’s climatic and environmental conditions. To get to the ghorfa, one can follow the path proposed by the artist; climbing up to this place is an integral part of the artwork. Initially, the path goes up by bypassing the ghorfa from behind in a counterclockwise movement. Then it goes back down along the river. For Younes Rahmoun, this path is symbolic: it is similar to a pilgrimage and its difficult access is a reference to meditation, which requires effort and perseverance. Before beginning the Beni Boufrah ghorfa’s construction, Younes Rahmoun gathered advice from village residents and answered their questions. It was in this exchange that mutual aid and listening began: the villagers provided water, straw, earth, donkeys to transport the materials, and tools while the traditional know-how of a local master mason who was helped by his assistants and scrupulously followed by the artist. In February 2008, during a day organized by the village youth organization, village children were also able to participate in the project. After explaining his work to them, the artist invited the children to plant a palm tree, an olive tree, and a fig tree, three trees that are very present in the Moroccan countryside and which, because of their place in the Qur’an, have a particular importance for the artist. This day was an opportunity to discuss art, but also social subjects such as pollution. Since then, the artist returns regularly to Beni Boufrah in order to repeat these kinds of discussions. Hence, if the ghorfa invites the viewer to commune with herself and to meditate, it also creates moments of sociability and significant reflection at the heart of a society marked by the disappearance of traditional practices that respect the environment.